We will again join Big Sunday for their Annual Back-to-School Drive and Community Dinner! Help send kids back to school in style as we stuff backpacks full of items for kids at a bunch of different low-income schools in L.A. and Long Beach. The sorting will be followed by, of course, a community dinner! 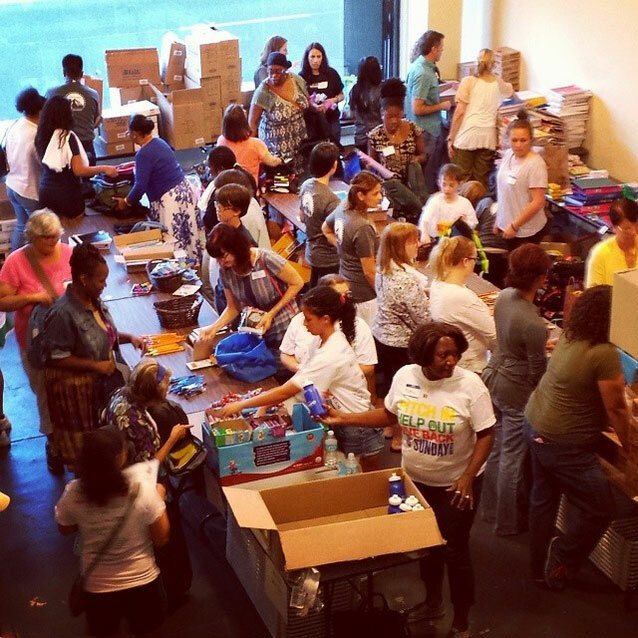 Big Sunday needs volunteers of all ages to help stuff backpacks (kids can help too! ), as well as school supply donations. Please feel free to drop off school supplies at the location above, or bring them with you on the evening of the event. For a list of school supplies that are needed, follow their Facebook page at facebook.com/BigSundayorg. As of this posting, there is a strong need for ballpoint pens, crayons, composition books, and many more supplies. All donations will be appreciated! Be sure to wear your Sunday Assembly shirt if you have one, and we hope to see you there! Volunteer at Big Sunday's Back-To-School Night!